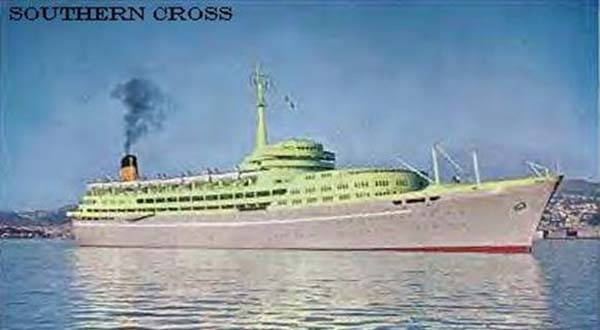 Built for the British based Shaw Savill & Albion Line, Southern Cross was one of the first ships to be designed with her engines at the rear to give more space for the passengers. Her maiden voyage from Southampton March 29th 1955 called at Las Palmas, Cape Town, Durban, Freemantle, Melbourne, Sydney, Auckland, Wellington, Fiji, and Tahiti, passed through the Panama Canal and called at Curacao and Trinidad before returning to Southampton. Southern Cross completed four such voyages a year with each taking 76 days. By the late 1960s, Jet aircraft were providing a service to most of these destinations. This led to Southern Cross being laid up at Southampton in 1971. The Ulysses Line bought her two years later to be operated under the name Calypso. After being converted to a full time cruise ship, Calypso set out on her first Mediterranean cruise from Piraeus/Greece April 25th 1975. Calypso only completed a few of these Mediterranean cruises before being chartered by Thomson Cruises. Thomson’s operated her on cruises out of Tilbury and Southampton/England, then later from New York - Bermuda. The Eastern Steamship Line of Panama acquired Calypso in 1980 to be operated under the name Azure Seas. With this purchase, they founded a new line called the Western Steamship Line. Azure Seas was then operated on cruises from the west coast of America - Mexico. The Western Steamship Line became known as Admiral Cruises following their merger with Sundance Cruises in 1986. With the cruise industry out of Miami - Bahamas booming by that time, the large cruise lines began buying up the smaller lines. The Royal Caribbean Cruise Line bought Admiral Cruises in 1986 and began selling off their smaller ships. This led to Azure Seas being sold to the Dolphin Cruise Line in 1992 to be operated under the name Ocean Breeze. She was again sold in 1999, this time to Imperial Majesty Cruises to be operated on short budget cruises out of Fort Lauderdale - Bahamas under the name Ocean Breeze. After arriving in Fort Lauderdale after her final cruise, the Ocean Breeze was laid up and put up for sale. In 2003, despite an Australian preservation campaign to save her, she was sold to scrap merchants and on the 25th August 2003, she departed the Grand Bahama shipyard where she had been laid up and headed out to sea on her final voyage. On the 3rd September 2003, she arrived at Gibraltar. On the 12th September 2003, she passed through the Suez Canal. Originally heading for Alang, she continued onward to Bangladesh where a higher scrapping price was tendered. Arrival at Chittagong in Bangladesh saw her beached ready for scrapping. By May 2004, there was nothing left of this once revolutionary ship.